On June 24, 2014, a shrub made headlines. 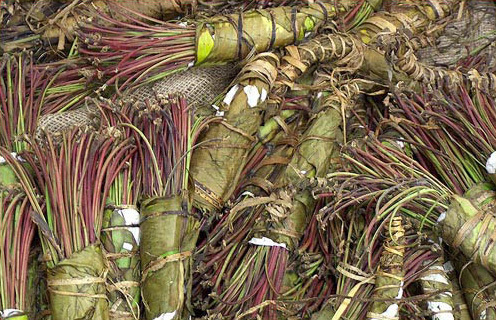 The U.K.’s Home Secretary Theresa May announced that khat, also known as miraa in East Africa, would be made illegal, following other similar bans of the plant in Western nations with large East African diaspora populations. The plant is cultivated predominately around the Horn of Africa in countries like Djibouti, Ethiopia, Eritrea, Yemen, and most notably Somalia. Khat, when chewed (or occasionally when brewed into tea), acts as a stimulant that has been described by some as the Arabian/Somali equivalent to coffee or tea, and by others as a harsh amphetamine-like drug that plagues society. Such vastly contrasting opinions of the drug lead many to wonder what the reason behind the khat ban actually is. Studies have found that consuming the plant causes excitement, euphoria, loss of appetite, and has a mild-to-moderate risk of psychological dependence (less than tobacco or alcohol), but the World Health Organization does not consider khat to be seriously addictive. Mustafa Al-Absi, a Yemenite professor of behavioral medicine at the University of Minnesota, recently conducted a study that found khat use is generally associated with tobacco use, and when both are used together, their effects can be associated with blunted cardiovascular stress response and enhanced negative mood. But most khat sellers and users are not members of organized crime. As such, many say that the punishment for chewing khat does not fit the supposed ‘crime,’ if it could even be considered one. David Anderson, director of Graduate Studies at Warwick University and author of The Khat Controversy, recently told World Policy Journal about his time working with the Advisory Council on the Misuse of Drugs (ACMD), which conducted an investigation for the U.K. government into whether or not the health, social, or criminal concerns caused by ‘khat culture’ necessitated a ban. Perhaps politics is the only plausible reason why a government-appointed scientific body would be completely disregarded by the very government that commissioned it. And in many ways, evidence suggests that prohibiting the use and sale of khat in Western countries further marginalizes an already disenfranchised diaspora population. A recent Guardian article describes how the U.K. ban on khat has devastated the economy of a small Kenyan town that prospered mostly on khat exports to diaspora populations. Furthermore, the prohibition criminalizes a cultural tradition practiced for thousands of years. The way khat is sold in countries that have illegalized the substance functions differently from the mafrishes (or khat cafés) that can be found where it is legal. Now, there are none of the cafés or shops that formerly characterized Somali communities in the U.K. and the khat culture they reinforced — limiting the opportunities for Somalis and others to socialize and connect with their communities. According to a report by the Transnational Institute, given the illegality, traders protect themselves through expediting sales, giving customers only minimal face time. Will Becker is an editorial assistant at World Policy Journal.